An artist’s rendering of the 3D printed lunar base (Credits: ESA/Foster+Partners). 3D printing, a technology that recently went viral in the DIY community, will now be studied for printing a Moon base. 3D printing is an additive process, where successive layers of material are deposited to generate a desired shape. Recent advances in 3D printing technology have made 3D printers affordable, and the DIY community has even made many printers which can be built at home. 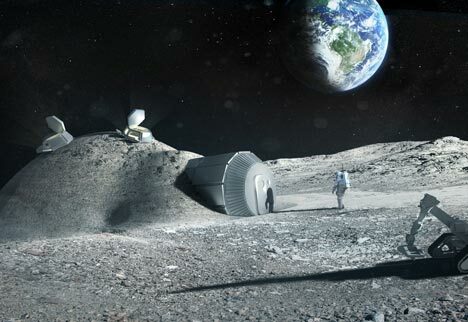 ESA and design group Foster+Partners are studying the concept of 3D printing for construction of a Moon base, utilizing the lunar soil (regolith) as a printing material. 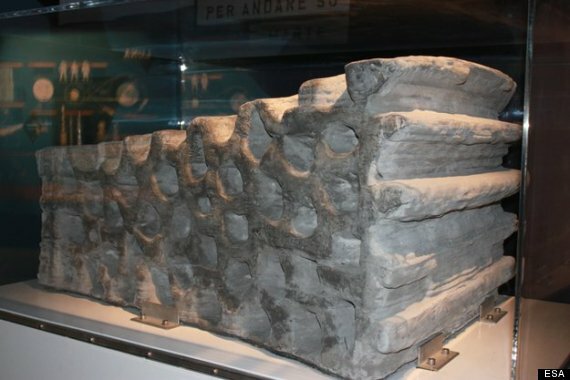 This 1.5 ton building block was produced as a demonstration of 3D printing techniques using simulated lunar soil (Credits: ESA). According to the researchers, the base will resemble a foam-like arrangement similar to biological structures found in nature. A part of the moon base has already been modeled, using a mixture of silicon, aluminum, iron, calcium, and magnesium oxide to simulate regolith. Foster+Partners has designed a four-person Moon base built out of lunar regolith. As the design will utilize in-situ materials, this would significantly reduced transport cost of materials over alternative options. “The planned site for the base is at the Moon’s southern pole, where there is near perpetual sunlight on the horizon,” officials for Foster+Partners said in a statement. Already experimenting with guns, sculptures, cars, and now a moon base, 3D printing still has many unexplored applications, and offers a variety of benefits compared to other manufacturing techniques, both on Earth and in space. Parallel to ESA, NASA along with Washington State University are also studying 3D printing as the basis for constructing a lunar base. These agencies are not the only ones exploring 3D printing applications in space. The company Made in Space is predicated on this technology. In the TEDx talk below, Made in Space President and Co-founder Jason Dunn discusses using 3D printing to colonize space using structures that can’t be built any other way. Yes Siddartha, 3D printing can be very much a thoughtful Idea for using on Space Exploration activities. It has its limitations (as of now, as I guess, as a technology). But sure for building space colonies and structures before the Astronauts can land and use them it is a perfect Idea. What 3D technology”s limitations are it only can build structures that are not technically functional.. but yes environmentally ! Still it can be a big step. The other other advantage is (for building living Quarters etc using 3D printing) is it doesn’t need ant astronauts, and that the big advantage is there is no atmosphere on Moon so we can expect least corrossion etc. As such when it comes to life supporting equipment still we need our own efforts (manual). As a beginning it can give an edge for a start and explore further what we actually have to need to improve. I have seen 3D printing in a University Lab (TU-Berlin), but only making complicated and intricate shapes using powder materials and in the shapes only depicting as art and but yes much intricate which we can not use any other manufacturing processes. I wonder tho, If this 3D printing can be extended for making Metallic parts and such (even can be useful in structures but static), and further I am sure it is a good technology and useful where men need need not have to stay in unforgiving environments, in our quest for space exploration.